One of the oldest cities in the country, Pushkar is a much-loved destination for countless tourists and devotees who come to the desert state of Rajasthan. Surrounded by hillocks on three sides and located at a height of 510 m above sea level, it indeed attracts a large number of visitors. The Nag Pahar forms a natural border between Ajmer and Pushkar which is fondly called the rose garden of Rajasthan. Along with mythological history, the legacy of the architectural heritage further adds on to the beauty of the city. According to legends, it is said that Lord Brahma, the god of creation dropped a lotus on the ground which lead to the formation of a lake. He decided to name the place after the flower and thus, named it Pushkar. The city is also home to the famous Brahma Temple, the followers of Hinduism consider visiting the city as an ultimate pilgrimage to attain salvation. Have a look at the sights to see here and be marvelled at them. Created by Lord Brahma, the lake is, hence, considered sacred and is called Tirtha Raj which in translation means the "king of lakes". The lake is semicircular in shape and is surrounded by not just one or two bathing ghats, but 52, along with 400 odd temples which is a sight to be seen. During the Pushkar fest, a large number of devotees come here to have a dip in the waters as it believed that the waters would wash the sins and cure skin-related diseases. The Brahma Temple here is considered to be about 2000 odd years old; however, the current structure dates back to the 14th century, which is built in marble and decorated with silver coins. The temple can be easily identified with its red tower and the image of a swan, inside the sanctum one would come across the four-faced idol of Brahma. One would come across a marble statue of the sun god standing watch at the temple who is depicted wearing a warrior's boots while the others gods are depicted as barefooted. The Varaha Temple is the oldest and the largest temple in Pushkar. Built in the 12th century by King Anajo Chauhan, it is dedicated to Lord Vishnu's third incarnation as a wild boar to rescue Bhoo Devi from the depth of an ocean. The temple is one most visited places in the town and attracts a large number of visitors. Situated atop a hillock right behind the Brahma Temple is the shrine dedicated to Goddess Savitri who happens to Brahma's first wife. To reach the temple one has hike up a long series of steps; during the hike one would be blessed with the panoramic views of the lake, the temples and the sand dunes of the Thar Desert. Another popular shrine here is the Rangji Temple, the structure showcases a mixture of Dravidian, Rajput and Mughal styles of architecture which is very evident here. Dedicated to Lord Vishnu, one would come across the a high temple tower which is very common in the temples in South India which attract a large number of visitors. Built in the 12th century with an underground shrine dedicated to Lord Shiva. The shrine exhibits the Hemadpanti architectural style of carvings which further adds to the majestic outlook of the structure. The shrine witnesses a large crowd especially on Shivarathri when people keep pouring in throughout the day and night to offer their prayers to the deity. Built to serve Raja Man Singh I as a guest house, the palace is one of the most visited spots in the town. The palace is a fine example of Rajasthani architecture, which truly is a visual treat. 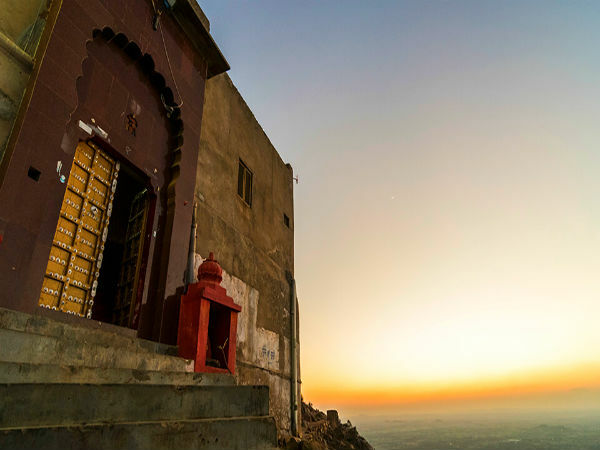 The palace now has been converted into a heritage hotel administered by the Tourism Department of Rajasthan and allows visitors to relish the beauty of the structure along with an awestricking view of the lake and the temples around the town.